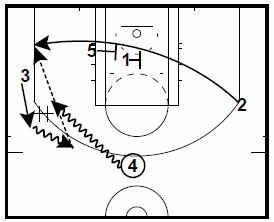 These two San Antonio Spurs secondary break actions are contained in Wes Kosel’s 2014 San Antonio Spurs Playbook. You might not be able to use them as early offense or exactly as presented, but hopefully there are pieces that you might use to add to what you are currently doing. The San Antonio Spurs Playbook is combined with the Comprehensive Ball Screen Playbook as the featured eBook bundle of the week. 1 passes to 3 then cuts in front of 4 to the opposite mid-point area. Once 4 has the ball, he dribbles toward 3 to give him the ball on a dribble hand-off. 3 uses the hand-off as a screen and drives middle. 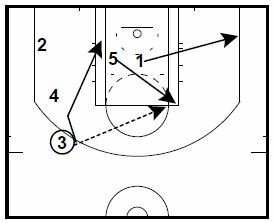 2 moves in from the corner to screen across for 5. 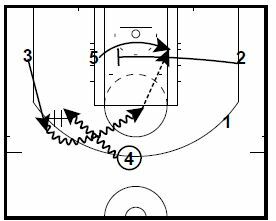 3 looks to score or pass to 5 at the basket. 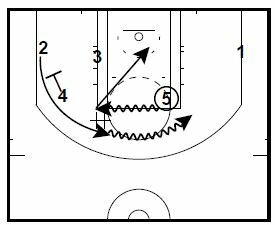 1 passes to 4 at the top then moves into the lane. 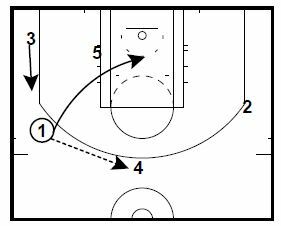 1 stops in front of 5 and joins 5 in a staggered screen for 2. 4 dribbles toward 3 and can either give him the ball on a dribble hand-off or pass to 2 in the corner for a shot. If 3 gets the ball, 5 moves up to the opposite elbow and clears out to the corner. 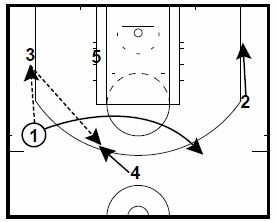 3 passes to 5 then makes a cut to the basket. 5 looks to make the give-and-go pass to 3. If 3 isn’t open, 5 dribbles across the free-throw line and looks to give the ball to 2 on a dribble hand-off. 2 cuts from the corner off of a screen from 4 to get the ball from 5. 2 looks to score, to 5 rolling, or to 1 in the corner.